Good news for budget travelers: Germany is a relatively cheap country to visit. Berlin, its capital, even ranks among the most inexpensive big cities in Europe. And we have some advice for you that will make the euro go even further - without taking the fun out of your vacation. Have a look at these Germany budget travel tips and save money, from flights and hotels to restaurants, public transportation, and sightseeing. The earlier you book, the cheaper the flight - in general. You can lower your airfare even more by visiting Germany off-season. The most expensive times to fly to Germany are in summer (June-August) and during the holiday season (December). So how about traveling to Germany between January and May, or during October and November? Prices and crowds will be much smaller. Flying within Germany and Europe at large can also be quite inexpensive. Berlin to Rome for 40 euros? Why not! Or you could even be brave and try blind booking. If you want to rent a car in Germany, reserve it online while you are still in the U.S. You will get much better deals if you get your rental car in advance and prices are often quoted in US dollars. Want to see Germany by train? Stretch the Euro with special passes and discount train tickets like the Schönes-Wochenende-Ticket, which allows you and five friends to travel to your heart's content for a whole weekend for just 35 Euro. Most German cities offer discount city cards. These special passes allow for unlimited travel on the public transportation system and get you discounts or even free entry to many landmarks, museums, restaurants, and events. Ask at the Tourism Office or at the reception of your hotel/hostel. Get a good night's sleep without worrying about money by staying in a German hostel. Most hostels offer single and double rooms (between 30 - 90 Euro) with private bathroom facilities. Many hostels aren't just discount, they're fabulous. Try the rooftop apartment of the ​Circus Hostel or get a little weird by staying in a 1930 caravan indoors (along with many of our other top hotel picks in Berlin). If you don't mind sharing a dorm with other travelers, you can save even more money and rest your head for as little as 12 Euro a night. Eating out in Germany doesn't have to break the bank. In fact, it shouldn't. There are many inexpensive and delicious eateries, traditionally known as Imbiss. Try some German specialties like Bratwurst and Currywurst that come as a meal (with Pommes - fries) for less than 5 euro. For something less German sausage, try favorites falafel or Döner Kebab, a meal you shouldn't pay more than 3 euros for. If you are craving fresh sandwiches, rolls, or pastries, stop by a local Bäckerei (bakery). If you have an international student ID, bring it! You'll be rewarded with discounts on everything from sights, shows, and museums, to movie theatres, swimming pools, and hostels. Several organizations, like the ISIC, supply student IDs that offer further discounts. Pay a visit to a German museum, but don't pay for the ticket. Many German museums have an entry-free day, so check the museum's website and don't miss this opportunity. Many landmarks and attractions in Germany are free. 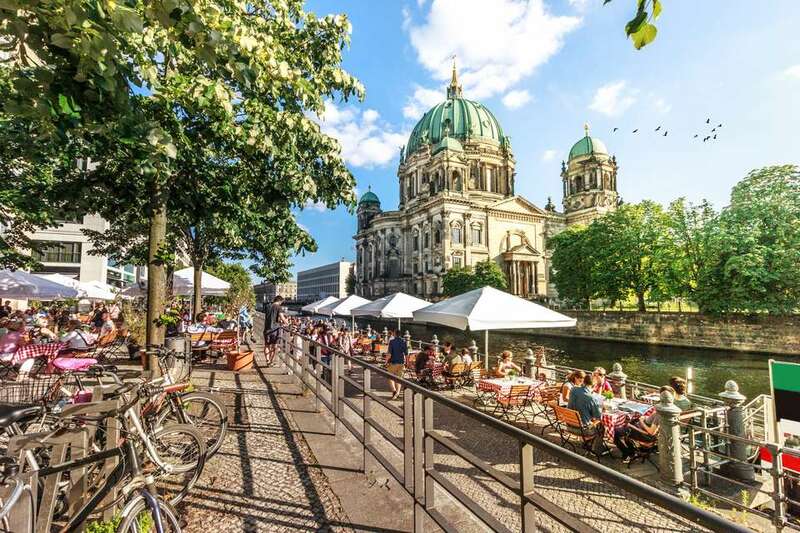 Take a self-guided Berlin walking tour that leads you to the best (and free) sights of the city, stroll through the Old Town of Munich, visit the Hamburg Harbor, celebrate at local wine festivals and traditional Christmas Markets, climb the Alps, hike in the Black Forest and swim in the Baltic Sea – all without paying a single euro.